Harvard SEED on Citizenship and Social Innovation seeks to create a community of outstanding young Chinese students in China and abroad. It advocates civic engagement by encouraging innovative solutions to social problems. Based at Harvard University and in collaboration with China’s premier nonprofit organizations, SEED runs interactive and hands-on training camps in the U.S. and China to select, encourage and support potential social entrepreneurs in their social innovation projects and future career. Harvard SEED on Citizenship and Social Innovation seeks to create a community of outstanding young Chinese students in China and abroad. It advocates civic engagement by encouraging innovative solutions to social problems. Based at Harvard University and in collaboration with China’s premier nonprofit organizations, SEED runs interactive and hands-on training camps in the U.S. and China to select, encourage and support potential social entrepreneurs in their social innovation projects and future career. It is our goal to build an innovative and cross-border community of SEED fellows. The acronym, SEED, stands for our core values – Social Responsibility, Empathy, Empowerment and Dedication. It is our hope to cultivate such “seeds” of social change in China. In recent decades, China’s civil society has witnessed tremendous growth as increasing civic participation decisively changed the pattern of welfare management in the country. Social innovations, mostly initiated by everyday citizens, are now a critical force in resolving social tension. At the same time, the explosive growth of internet gave rise to a new generation of young leaders who begin seek to address social problems in China not through official channels; instead, they seek to enact social change by seeking creative solutions from the grassroots level. Through their work and by their spirit, they are sowing the seeds of change in China. During such a transitional period of China’s civil society, it is critical therefore that these young professionals and emerging leaders form meaningful connections with their international peers. Theories and practices of civil society in Western countries took more than a century to develop; they represent intellectual heritage of generations of scholars, activists, and organizations. As China assumes a more prominent role on the world stage today, its social boundaries also transcend national boundaries and require collaborative solutions. 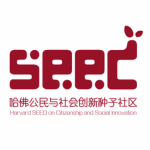 It is with such hope of expanding knowledge and friendship that the China Citizenship and Social Innovation SEED Community at Harvard, together with the NGO Research Center at Tsinghua University and Philanthropy and NGO Support Center, have decided to enter a strategic partnership to host the SEED Forum on Citizenship and Social Innovation.